April 22,1977 & April 1, 1978. 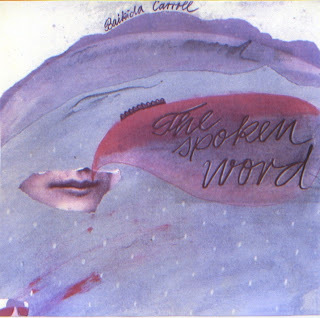 Baikida Carroll’s made important contributions to some truly great recordings, and yet his own material seems to get far less a profile than it should. 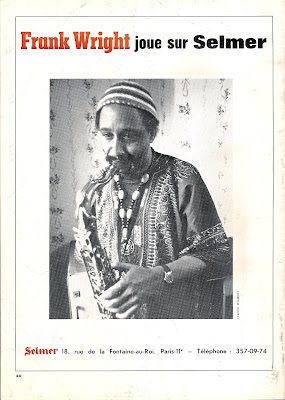 He was part of the Dogon A.D. band under Julius Hemphill’s leadership, part of David Murray’s big band Live on At Sweet Basil, and part of the Black Artists Group on In Paris, Aries, he’s on John Carter's Castles of Ghana, Oliver Lake's NTU, Muhal Richard Abrams' Blues Forever. Given how readily he seems to work with others it’s quite a surprise to find how inventive he is out on his own. Here’s a double LP’s worth of some interesting and stimulating music, where he uses volume (and lack of it), messed-up instruments and even some strong playing to truly talk through his horn. Thanks again to Dale for passing this on to me. This is a fairly brief set of Charles Tyler tunes recorded at the WKCR Studios, NY, NY, arguably the best jazz radio station anywhere. 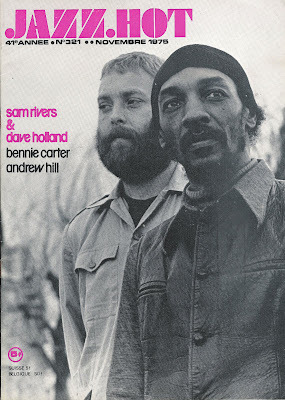 The first track features the key players of Earl Cross and Steve Reid which in July of the same year recorded the wonderful "Voyage from Jericho" with Ronnie Boykins stepping in on bass and with Arthur Blythe making a guest appearance on a couple of tracks. Reid was also on next year's "Live in Europe", both rereleased on the Bleu Regard label out of France, but becoming very scarce these days, I believe. Both are very good, but the Jericho is essential. Also look out for the extensive "Saga of the Outlaws" on the Nessa label. 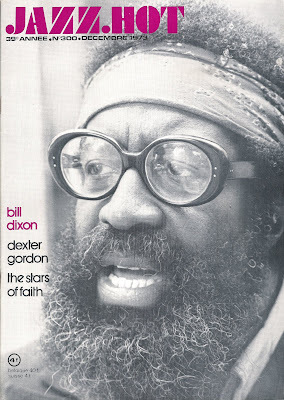 The second and third tracks are playful, improvisational duos (theatrics and dramatics) with Philip Wilson (who also made a very fine duo record with Lester Bowie at about this time, briefly mentioned in the interview snippet at the end of this collection). Tyler would often alternate between alto and baritone. Personally I prefer his alto sax, which better brings out the sweet melancholy of his tone, but the gruffness of the baritone does not hide it completely. 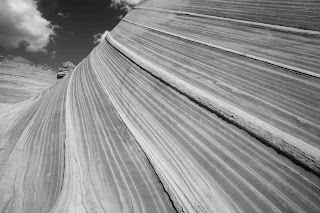 This is another Dime download/seed, but, oddly enough, no takers, so I'm hoping for a little more responsiveness here. Tyler deserves it. Vitous of course is perhaps most noted as being a founder member of Weather Report, so was in the vanguard of early fusion. 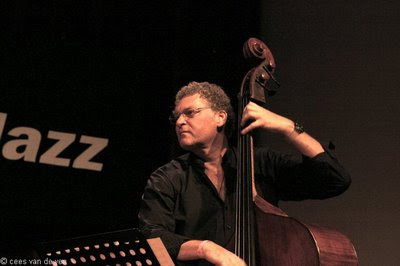 He also played in the excellent trio with Chick Corea and Roy Haynes, and more lately with Jan Garbarek. I don't know whether this quartet played together often, but on this recording they really get it together. 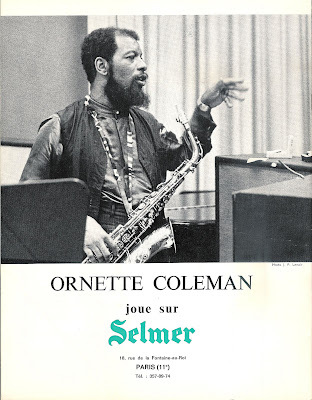 The first track is reminiscent of WR, Surman even sounding remarkably like Wayne Shorter. 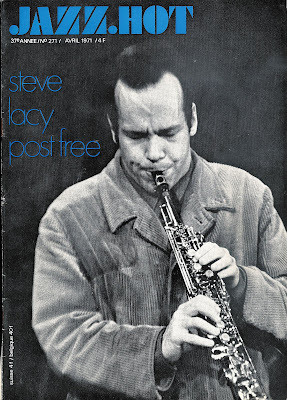 The third track starts off with a ferocious soprano solo from Surman, and turns into one of the numbers from an early album of his, I don't recall which one. 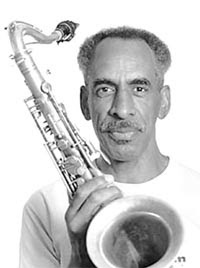 I'd never heard of Kenny Kirkland, but apparently he played with Wynton and Branford Marsalis among others and featured on Vitous's ECM recordings. He had a drugs problem and died at an early age in 1998. This is a very good quality FM broadcast. Thanks to ricola for seeding. Links in comments. BUSCHI NIEBERGALL TRIO feat. MICHEL PILZ "MOERS 1978"
This one was somehow prompted by a discussion in the comment section of an earlier posting where one commentator professed his admiration for the work of Michel Pilz. So when the opptunity came to download this concert from Dime, naturally I had to take it to find out. My inclination had been in the direction of people like Michel Portal and Rudi Mahall (and we shall have both in upcoming posts), but Pilz is certainly a worthwhile addition to the premier league. I find him distinctly different - more linear, flowing if these words make any sense - not unlike Brötzmann. Listening to this 30-minute piece, I find Mr. Pilz overshadowed by Mr. Niebergall who has a physical attack which reminds me of the great South Africans Harry Miller and Johnny Mbizo Dyani. You get the feeling that once he's through, the whole damn thing can be sold off as scrapwood. 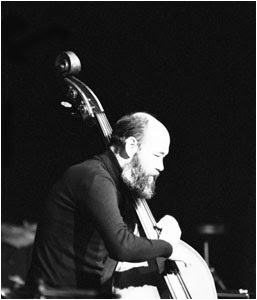 Niebergall was in the forefront of the first generation of German free jazzers, having played with virtually anybody on the scene, including Brötzmann himself. This particular line-up with Pilz and Uwe Schmitt on drums appears only to be documented on a 1978 release "Celeste" on the Trion label. There's one to hunt for! Niebergall ceased making records round about 1980 and reportedly lived in recluse in Frankfurt a.M. until his death in 1990. A short radio intro and then "Tilip", recorded at the Moers New Jazz Festival on 15 may 1978. What's on offer here is 30 minutes plus of dynamite. Dig in! 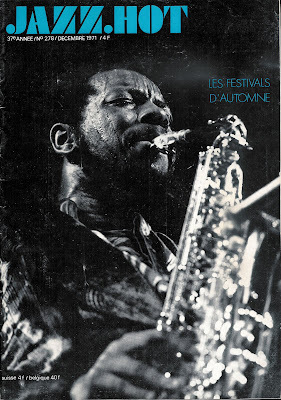 Recorded at New Jazz Festival, Moers on May 15, 1978. I will post Flac and MP3 shortly. Following on from the recent Hamburg Concert, and with special thanks to Boromir for posting the interim Bergamo piece, we continue with Circle. "Quartet Pieces Nos. 1, 2 & 3". Recorded in the studio - New York - 21st August 1970. Barry Altschul, drums, percussion, bass-marimba, vibes. These three fascinating pieces are the earliest example of Circle's other side, their work in a lifeless studio, with no engrossed audience to offer inspiration, challenge or acceptance. All three pieces were issued only on a Blue Note 2LP set called "Circulus", under Corea's name, and have never appeared on CD, to my knowledge. This rip is taken from the original vinyl, with apologies for the occasional surface noise. 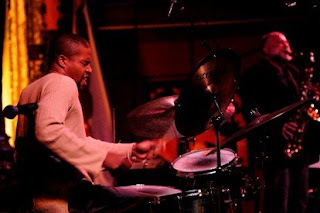 The music is also the first recorded evidence of Braxton playing with what was until then Corea's trio. 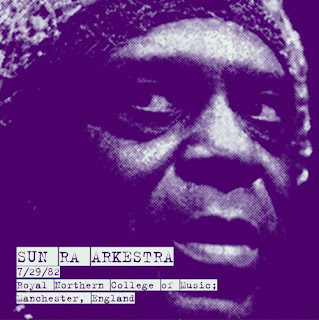 In the opening minute or so, the musical aesthetic promptly reveals itself to be far closer to developments (in 1970) in European-style free improvisation and contemporary classical music, rather than the conventional notions of jazz. All three pieces are open improvisations, stark, spiky, a tad austere, with a disorienting use of space, unnerving deviations, terse twists and turns. A volcanic highlight appears on Piece No. 2 at the 5 minute mark, where Corea suddenly hits upon a single note, wrings the life out of it in seconds and sends the entire band careering off in a wholly unexpected (by them) direction. All the musicians use a wider-than-usual range of instruments, e.g. Holland on acoustic guitar, Corea on vibes and Braxton's vocal contribution at end of Piece No. 2 will surely raise an eyebrow or two. The musical results show thrilling interplay, rich in detail, and no lack of careful listening among the players. What is more extraordinary is that just three days before these recordings were made, Corea and Holland, both on electric instruments, played an explosive set with Miles at Tanglewood on 18th August and followed it up a few days later with Miles' Isle of Wight Festival appearance on 29th August in front of a mere half-million people. In between the two, they tossed us these three acoustic gems. During the next few weeks I will be posting this entire festival in chronological order. Published in the Athens Banner-Herald on Thursday, April 1, 2004. 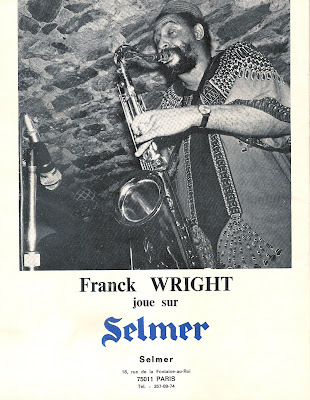 As the last pictures post seemed to please a lot of you, here are a few 1970's covers from the French magazine Jazz Hot. Particularly nice pic of Braxton playing chess ! 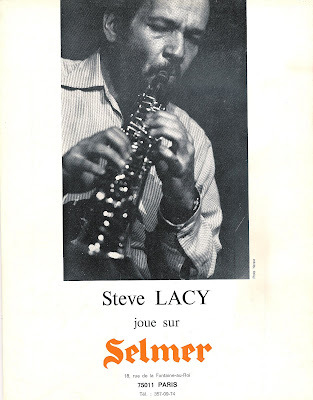 Credit is as follow : Lacy : Gérard Noël /Coleman & Braxton : Latapie-Trombert / Dixon : Latapie / Rivers & Holland : Alex Dutilh. I've been working on an online database to store scanned material related to the kind of music we share here, and it is nearly operational (should be working in a few days). For the moment there is something like 70-80 articles - mostly interviews, not available elsewhere on the net - stored in it but that number could grow quickly if things go well, that is to say if people want to participate and upload their own material. In order to avoid legal problems linked to copyright issues the database will be private but anyone interested is welcome, whether you have things to share or not. To stay informed, please send an email to the address in the comments and I will answer with a detailed text on how to make things work and a password. If things go well, this database could become a great tool for all of us making researches on free music so let's hope it will ! PS : if one of our dear readers is a drummer and has 30 minutes to lose, I need your help so please get in touch :). 3 CDs, the links to the first includes scans and text. Flac an MP3s to follow. Please no comments until I've posted the RS links. 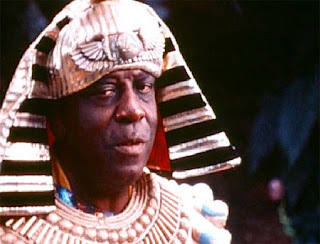 I'm off to Europe, will post more SunRa in September. Put tracks 1-8 on disc 1 and the remaining tracks on disc 2. Then the original tape side 1 would be on disc 1 and tape side 2 would be on disc 2. An exceptional concert -- one of the few times Art Jenkins' bebop scatting was captured on tape. Eddie Gale confirms his presence on this tape. Flac and MP3 forthcoming. No scans. A few more of those French ads from the 70's featuring free players. 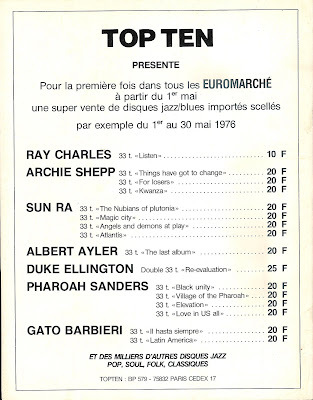 The most surrealistic being the last one, advertising the availabilty of Ayler, Shepp, Ra and Sanders records in all "Euromarchés", a French hypermarket chain ! 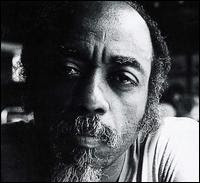 In April, sotise posted a stunning Cecil Taylor Unit concert from Berlin in November 1975. 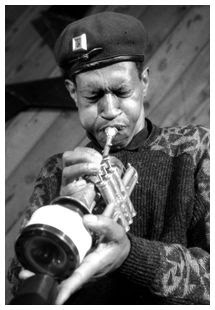 This concert is from six months later, and has moments that are equally powerful - the sheer force of Jimmy Lyons' alto in the first section, and his interplay with Cecil and David S Ware, is breathtaking. The recording is from an FM broadcast and is also very good. Many thanks to abbcccus for reseeding this recently on dime. 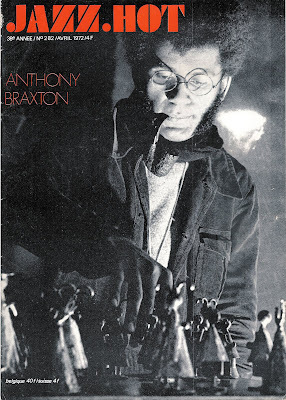 Original broadcast WCBN-FM / National Public Radio "Jazz Alive"
Here are two good audience recordings from recent concerts in Europe by the Anthony Braxton Diamond Curtain Wall Quartet. (Many thanks to the tapers and seeders on dime - blackforest and decade). There is a short clip on youtube of the Moscow concert which gives a good feel for the interplay between the group and the atmosphere of that concert. Overall it's the recording I like best, as the music is closest to the ghost trance music of the Iridium set. By contrast, the Besançon concert makes much greater use of 'noise', in the manner of the Wolf Eyes music, which I like less - even though I suppose it is a natural extension of the drone which underpins much of GTM. (Having said that, much of the music is still astonishing). 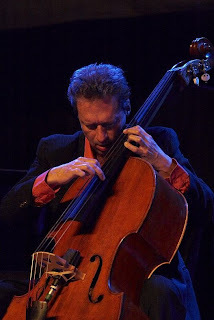 "Ernst Glerum (b.1955) is a bass player with one of the best Dutch orchestras: J. C TANS and THE ROCKETS, and also composes much of the band’s material. 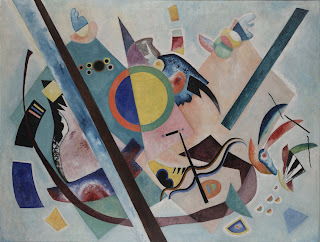 The quality of this and other work caused the NOS to invite his composition for the 1986 Festival. Glerum chose to write for an eleven piece orchestra, the members of which were brought together especially for the occasion. 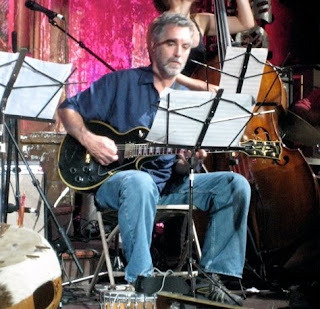 The resulting music was a wonderful combination of traditional music forms and playing techniques and contemporary improvised music. The band consisted of: 1 trumpet, 1 trombone, 1 tuba, 3 reeds, piano, electric guitar, bass and two drummers. Glerum added to these already manifold talents of composer, leader and basist, by playing a minature electric organ, the Philicorda, which had been marketed for home use some years before and which under the magic touch of Glerum emitted some splendidly silly sounds. To emphasize the traditional element within the music Glerum called the band New Klookabilities, a name derived from “KLOOK” the nickname of the late Kenny Clarke." A Friend ,who wants to remain anonymous has sent me this. Carolann Nicholls (voc). Rec. by Eddie Offord at Advision Studio, London, February 7th, 1969. This is almost folk like , very different to the pointilism derided as plink plonk scratch by detractors, which characterises most of their out put. Heres another great concert originating from dime. great sound ...as good as any official recordings by Parkers regular trios..many thanks to H, and the taper/seeder /traders!! as for recommending a favourite official release, its a tough call because they are invariably good. This comes as a liberated track from a bootleg Chick Corea compilation LP, seeded by inamorata (many thanks to him for letting it out). The original lineage is not clear, probably an FM broadcast, good quality. I don't worship at Braxton's shrine, but I do like this. I guess someone, somewhere has the remainder of this recorded concert. Anyway, it's a track to add to the Hamburg concert recently posted. As it's only a short recording, I'm posting in Flac only, link in comments. How often do we see the image of free jazz musicians being used to sell something else than their own records ? 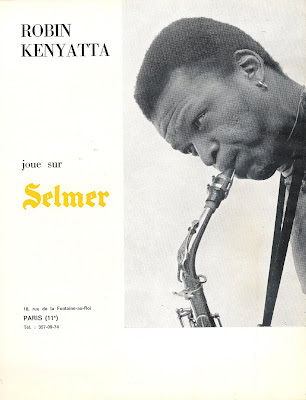 Vintage Selmer ads from the back covers of early 70's French jazz magazines. No music in this post, just those nice pictures from another time ! Next number is our Penck series, this one features Frank Lowe & Louis Moholo (side B only). no issue # (LP) (SW) --issue # of "A 0022" is given by some sources, but is not seen anywhere on the recording itself. 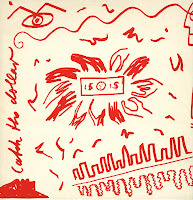 * Penck is credited w/ drums on front cover, piano on back. 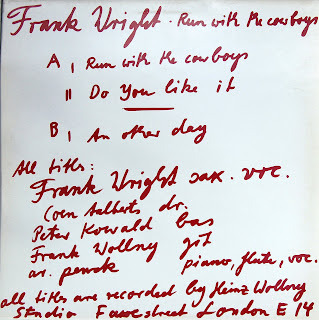 Continuing the Frank Wright series and his 80s recordings, this is a private lp release that was recorded at Studio Fawe Street. London E14. No date is given for this recording. The back sleeve reports only one track on side 2, but a closer inspection of the record reveals that there is indeed a second track, which turns out to be a continuation of "Do you like it". For sake of convenience, I've split side 2 into two separate tracks. New to this record is that Heinz Wollny is recording, but not playing, and Peter Kowald has been brought in to take care of bass duties and Coen Alberts to man the drums which is all for the better, in my view. There's much more of a consolidated group sound here centered on the Wright - Kowald - Alberts trio and Frank Wollny, the most accomplished of the TTT lot, falls in nicely with the "outside" trio. Mr. Penck dabbles on el-piano throughout and is more of a distraction than a genuine contributor, but if you manage to somehow abstract from his "contributions", the record is not at all bad, not the least due to the presence of Wright and Kowald. This is a good quality radio broadcast. Thanks to seeder and taper. MP3 and Flac links in comments. 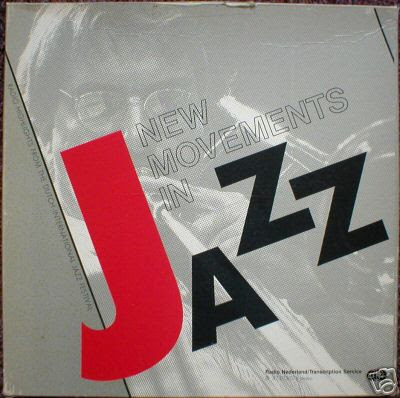 Here’s some more icp , recorded live in 1983 and preserved by the netherlads radio transcription service, subsequently released as disc 1 of a 4 lp set called ‘new movements in jazz’. This is for J a friend who likes his Herbie Nichols. I have unfortunately not been able to find any references to this set on line, nor can I find appropriate scans or photos , my scanner is broken and I simply cannot afford to replace it. If anyone owns this and would like to share some scans of the extensive notes that go with the package ,please do so in the comments. I’ll be uploading the other lp’s in the set soon. 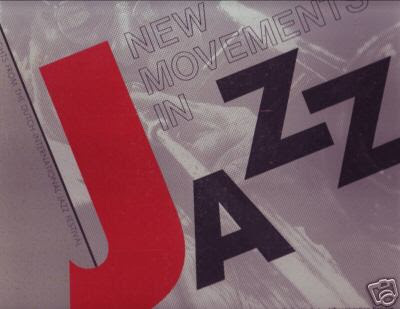 NEW MOVEMENTS IN JAZZ: various artists This 4xLP set features ICP Orchestra & Guest soloists, Contraband, New Klookabilities, Maarten Altena Octet. 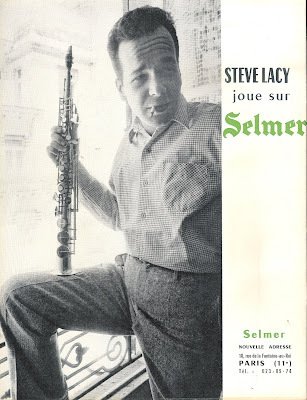 Steve Lacy: soprano; Kent Carter: bass; Misha Mengelberg: piano; Han Bennink: drums; Michael Moore: reeds; Sean Bergin: reeds; Paul Termos: reeds; Wolter Wierbos: trombone; Garret List: trombone; Larry Fishkind: tuba; Maurice Hortsthuis: viola; Ernst Reijseger: cello. Following Pierre's posting and jumping ahead in time, this is in all likelihood the last extant recording of Frank Wright. He died on 17 May 1990 and according to the information I've got, this was recorded on 4 March. It was made at the Galerie Holm in the South German town of Ulm on the occasion of an exhibition of A.R. Penck's graphical works. It's quite obviously an amateur recording, under less than ideal conditions and with quite a bit of chatter in between and during tracks. 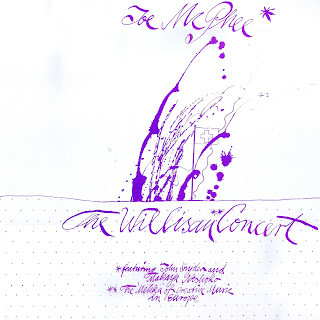 Checking the Penck discography at http://www.bb10k.com/PENCK.html, it appears that there is a cd release of this date and the above cd covers are taken from that release. I haven't been able to trace that release on-line which presumably would have sounded much better. 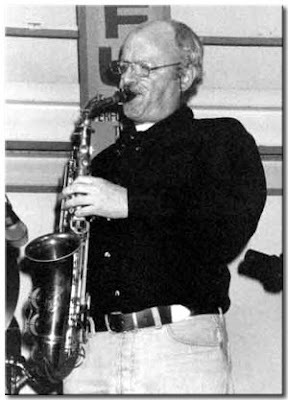 At this point, the band was down to Wright on sax and vocals, Frank Wollny on el-bass and Mr. Penck himself on drums. I've never been a fan of Penck the drummer. I find his style cluttery and clattery, and Wollny does a fair enough job on bass. 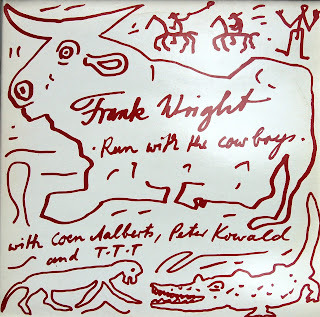 So this is really for Frank Wright completists, but who isn't? Quite a reverby recording, no known tunes except track 4 which is "Jerry", somewhat of a Frank Wright staple. It first appeared in a trio format on "The Earth", his debut album for ESP back in the sixties and later in a quartet format with piano on "Shouting the Blues", an album released in France in the late seventies. Not much point in doing a flac of this one, imho, so only high-quality mp3s in the comments section. The next one will be better, I promise! 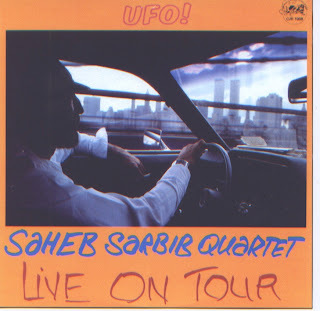 This is a wonderful live recording, with the bass, drums and two saxes line-up that Sarbib seemed to prefer. This was a new recording to me, although I know his Soul Note releases from the same period. I'm again indebted to Dale, bits of whose collection I'm letting loose to those who'll give the material a listen. As I work through the records Dale's shared with me I am beginning to realise what a man of good judgment he is. Most of the LPs he's shared are new to me, but they all contain truly marvelous music. I've been playing them on tight rotation for several weeks. My comments are based upon these recent experiences. Sarbib is a driving bass-player, who writes angular and abstract themes which the saxophonists obviously enjoy playing no end. The double alto front line is an interesting one, and works well, especially as the stereo allocations allow the listener to hear who's playing at any one time. Whitecage plays on one of the Soul Note releases, but it's long-term associate Lazro who really impresses especially on the opening track. Bues seems to understand every twist and turn that Sarbib makes, and I had a big grin on my face for most of the time I listened to the two of them tumble around. I'm a sucker for such playing. The LP's cover contains the transcript of an interesting, and at times playfully combative, interview with Sarbib by Bob Rusch from Cadence Magazine. There's quite a bit to learn about the bassist here, even when he is being purposely illusive. The middle eastern sounds that come through the themes and the band's playing seem to be something to do with Sarbib's origins, and his fluency in fusing the tightness of bands in the jazz tradition with free playing, Asian and African influences owe a lot to being the son of a jazz musician and studying widely across the world's music. I'd certainly like to hear more from the man, whose music I only have a small sample of, and I'm completely ignorant about his European work and US-based big bands. The origins of 'One for Mo' are clear; 'Egypt' is the strongest articulation of the North African themes in his work; and 'UFO' describes the landing of a craft from another world. It's the most textual of all the tracks. 'Between C&D' isn't a musical reference as I first thought, but named for the Manhattan 10th Street loft of John Betch, whom Sarbib has played with. Whitecage has his strongest playing here, with twining, bluesy lines forming round mellow bass and percussion. When Lazro, solos the band go into overdrive, and then sit back and admire all that they have achieved, prod it some more, and then let Sarbib have pretty traditional solos, before a jolly ensemble out. The audience are strangely reserved, possibly not familiar with the music. I'm guessing it was recorded in Europe, possibly France. For those of you looking for some funky, chunky, Jaco Pastorius jams, this isn't the place. For those looking for extremely free playing where Mangelsdorff's trombone runs wild and chaotic, this isn't it either. For the fusion freaks entranced by Alphonse Mouzon's skittering drum work that stops and starts on a sliver of light, best look elsewhere. For the rest, who are seeking great jazz in any configuration, this just might be your ticket. Recorded at the Berlin Jazz Days in 1976 and originally issued on LP while Pastorius was at the height of his tenure with Weather Report and playing an all-Mangelsdorff selection, this trio delivers an inspired performance that relies on timing, virtuosity, and a little humor for its bread and butter. The title track is the opener, and its slight abstraction is quickly replaced by Pastorius suggesting the frame of the melody to his counterparts, who pick it up and glide. On "Zores Mores," knotty little post-bop lines are woven into an easy framework of Mouzon's dancing hands and a solid yet very flexible interplay between the trombonist and Pastorius' ever-inquisitive basslines. The shimmering tension between the trio's members is all heat on "Accidental Meeting," the closest piece to pure abstraction here, but Mangelsdorff insists on, at the very least, the articulation of jazz formalism. "Foreign Fun" starts out like surreal circus music, but quickly walks the razor's edge between Weather Report's more adventurous material and noirish jazz. 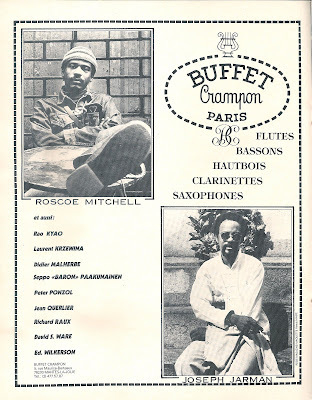 The set closes with the groaning humor of "Ant Steps on Elephant's Toe," a bumping, bubbling, dub-style cut that features Mangelsdorff blowing fully out of the blues and Pastorius playing the very best Aston Barrett he can. The dub effect gives way to funk about halfway through, and Mouzon becomes animated, doubling and tripling his cohorts in a joyful dance of curiosity and discovery. This cut is street-tough, plenty nasty, and leaves the audience -- and listeners too, no doubt -- begging for more. 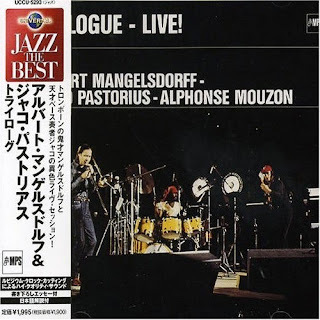 Albert Mangelsdorff, tb/Jaco Pastorius, eb/Alphonse Mouzon, perc. MP3s links in comments, if interested, ape or flacs would be offered. This short (12 minute) FM broadcast appeared on dime over the weekend (thanks to natefrawg), and I thought I'd share it here as it is very listenable and has a lot of music, despite average to poor sound - in fact, the sound very much adds to the atmosphere. Details of this unissued radio session are also to be found here. 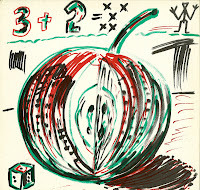 As promised, we start a little series of Penck LPs posts. This one as already been up on Church Number 9 but is presented here in flac & high quality mp3. If any of you knows how all these sessions came about, we'd be very interested to know. Perhaps the most widely-known fact about Elton was that he gave half his name to a budding popstar legend. For those who don't know the story - in the 60s Elton co-led a band along with blues singer Long John Baldry. The band's pianist took half his professional name from each of these guys and went on to fame and fortune (whether these were deserved is a matter I won't get into). Elton was an early member (though not a founder) of Soft Machine, and with the Soft Machine Legacy which was a reunion band formed around 2002. 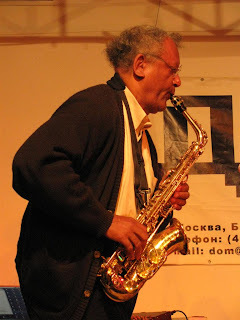 In the intervening years he played in numerous free jazz groups along with Keith Tippett and others in that circle. 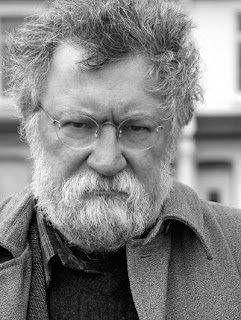 Newsense, which was put together in 1997 is a little unusual in having three trombonists, led by the great Roswell Rudd. Rutherford worked frequently with Elton in Keith Tippett's band, and Annie Whitehead is the best female British trombonist around. The numbers on this concert are an interesting mixture of free group improvisation and big band arrangements. The brass blend together extremely well. The guy who seeded this on dime (can't remember his moniker, but my thanks to him and to the original taper) did so on the second anniversary of Elton's death in 2006. Sadly, last August, Paul Rutherford also passed away. I think this recording is a fitting trubute to them both. Sound quality on this FM recording is excellent. MP3 and Flac links in comments. Recorded at Studio We, New York City on April 12, 1975 (tracks 1&2) & May 21, 1975 (tracks 3&4). Released on CD in 1997. Richard Dunbar (fh), Ahmed Abdullah (tp), Ted Daniel (tp), Charles Stephens (tb), Charles Tyler (bs), Kappo Umezu (as, bc), Hassan Dawkins (ss), Danny Carter (ts), Tatsuya Nakamura (perc, tubular d), Steve Reid (traps), Richard Pierce (b), Melvin Smith (g). This may well be David Murray's first commercial recording. It also features a host of players who went on to define the late 1970s New York loft jazz scene. 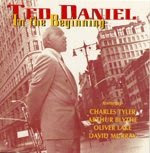 The CD included a short essay by Daniel on the music and its context. It seems to imply that these recordings were not previously available. The ensemble was a horn-heavy big band characteristic of the time. I have to admit that I bought the record as part of my attempt to collect everything David Murray had recorded, but the music is perhaps as interesting for the contributions of others, and it's value is in what it tells us about the time. You'll need to make a little effort to listen to this, as it seems to have been recorded from a single mic in a largish room. However, the mastering is good, and the playing always interesting. Daniel says he conceived of 'Greeting' as part of a suite, with this part conveying majesty. There's solos from Daniel and Lake, and it seems that the written theme was liberally interpreted by the players with some conducting from Daniel. The far more interesting 'Illusions', seems to be a wander through the history of big band playing. As the journey unfolds we move through ensemble work, improvisation amongst sections, and some solos. 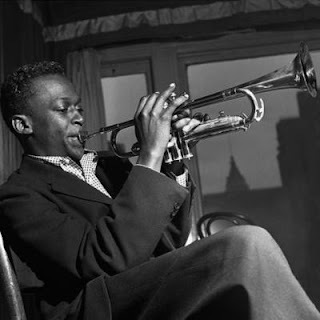 Murray opens the solos, and although many of his mannerisms are apparent, and the gospel top notes shriek out, he integrates this with other horns, responding to their interjections. There's some great trio playing against a horn section riff. The ideas for the WSQ are apparent here. Blythe is clearly more accomplished at this point, and I love the duet with Melvin Smith's guitar. It's like ten pieces of music bundled into one. 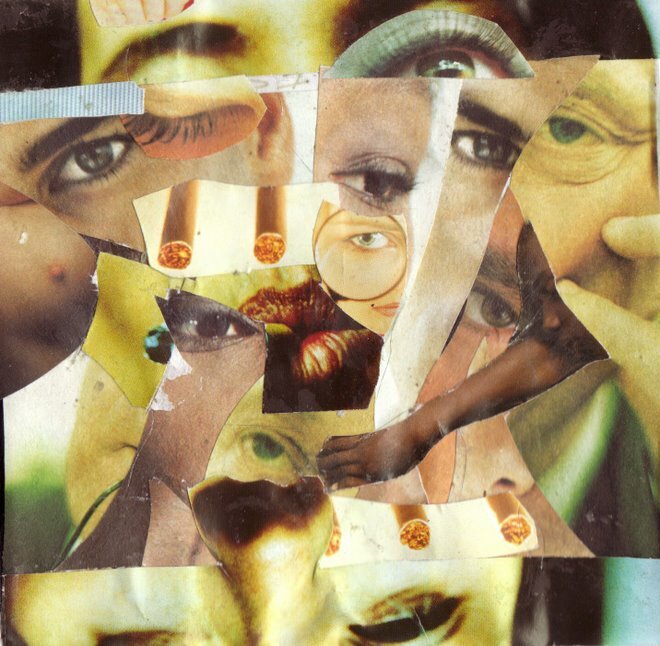 Tyler's 'Folly' is very military and vaudeville at the same time. Some ensemble work and horn soloing gives way to a guitar-led cacophony cut through with percussion. there's less variety in this over twenty minute piece. 'Hassan' features Murray as the new boy on the block. It's my favorite here. 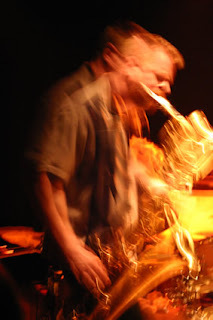 Lot's of variety, multiple short solos integrate into a textural flow, which regularly congeals into a swinging ensemble style which then slowly unwinds again. It's easy to see from this track why Murray made such a quick impression on his arrival in New York; even amongst players with more experience on the scene. This is more an intriguing snapshot in time than a classic recording, but I hope you enjoy it. many thanks to "serviceton" for providing this wonderful album, i am grateful to have a clean and intact version of this. on the day that i bought my copy 15 years ago from a second hand record store ,there i was smugly walking back to the train station thinking what a lucky score to have nabbed it in mint condition for a few bucks , when suddenly i bumped into a pole and dropped the bag the lp was in , it fell hard onto the concrete and subsequently rolled into the gutter , chipping the edge making the first track on either side unplayable. 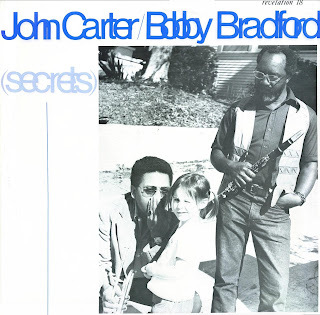 “2 records were released on Revelation Records by the Carter / Bradford group. The 1st, from 1969 and credited to the New Art Jazz Ensemble was entitled 'Seeking' and is the record that was re-released by HatArt on the early 90's. The *other* Revelation LP came out in 1972, and is titled "Secrets'. It's never been put on CD, which is a pity as it's a warm & intelligent jazz record. 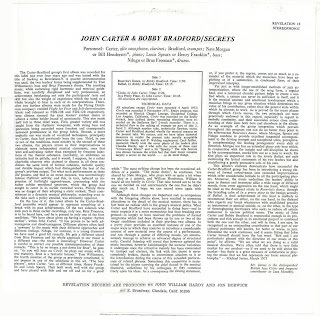 btw/ if there's any demand serviceton and i , both have more out of print john carter material. To complement Dale & Wallofsound recent McPhee posts, here is the second Hat Hut release. Standing between "Black Magic Man" and "Tenor" is not an easy place for a record in a discography but this one fits quite well. The formation is a trio, with McPhee playing tenor and soprano, John Snyder on synthesizer and processed voice, and South African Makaya Ntshoko on drums. For those who don't like synthesizers, be warned that it is not used here as a gimmick or as decoration. 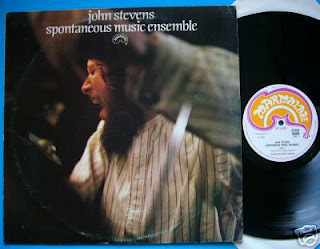 It has a very big, uncompressed sound typical of the experiments of the 70's and at times it feels like it is the center point of the music, at least in terms of sound mass. It has been a long time since I posted on Inconstant Sol so expect a lot of nice material in the near future. In the meantime, hope you enjoy this one. Note : I wanted to post K. Curtis Lyle & Julius Hemphill until now very rare "Collected Poems for Blind Lemon Jefferson" M'Bari LP as a complement to "Dogon A.D." but I found out that it has been reissued by Ikef records. The label does not seem to have a web site but is widely distributed.